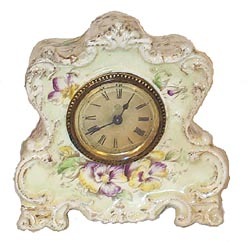 Ansonia Clock Co., porcelain case, "Bobwhite", ca 1895. This is one of the miniature series very similar to No. 146. Most were cream colored and decorated with flowers and gold gilt. This clock is only 5-1/2 inches high, has no breaks, chips, or repairs. Movement is one day, time only, runs long enough to get your hopes up, then quits. Nice beveled glass, brass sash; 2 inch paper dial is signed.